Earplugs have long been promoted as a way to help avoid noise induced hearing loss (NIHL) and to protect the ears from noise trauma. Many people use earplugs during sleep either because of a loud snoring spouse or because of hypersensitivity to nighttime noises. These people are to by admired for their dedication to their ears--hooray for you! But proper earplug use and awareness of restrictions and care is also an important part of your hearing health. Earplugs are great to help protect against loud noises and to limit exposure to work noise or annoying noises. No matter if you use foam earplugs, custom molded, or pre-molded ear plugs these guidelines can help you understand the dos and don'ts of earplug use. If you need to wear earplugs every day at work or nightly to avoid noises, you want to make sure that you are either discarding foam ones daily or are cleaning custom or pre-molded earplugs regularly. 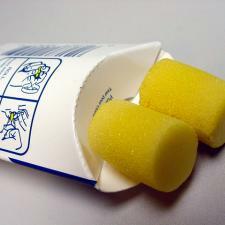 Overused and uncleaned earplugs are susceptible to bacteria and can introduced dirt into the ear canal. In addition, earwax can cause molded and pre-molded earplugs to become rigid, putting strain on the ear canal. This can cause ear infection, severe pain, and even hearing loss. The opposite of what you are trying to do by using earplugs. The basic rule of thumb is to discard foam earplugs daily and to clean pre-molded or molded earplugs every day with a toothbrush and hydrogen peroxide and soap and water mixture. Leave the earplugs out to dry or wipe dry with a clean, dry cloth. Earwax might seem an annoying and useless function of the ears, but it's actually quite useful. Earwax AKA cerumen is produced by glands in the ear and is part of the ear's natural process. Earwax protects the skin of the ears, lubricates, guards against bacteria, and helps clean the ears. Typically earwax slips out or your ears, along with all the impurities, without you even knowing it. But use of earplugs can stop up this natural process and can lead to a buildup of earwax. Hearing can be compromised by built up earwax, so make sure to use Ear Wax Removal Best Practices or see a hearing health professional to have your ears professionally cleaned and cared for. You should already be seeing a hearing health professional annually, but below are a few telltale signs for when to see a professional to have earwax removed. ￼￼￼￼￼especially important. You should pull up and away on the top of your ear with the opposite hand so the earplug can slide in easily. 3.Hold the earplug after inserting it. This incredibly helpful video shows the above in easy to follow detail and also shows what an IMPROPERLY fit earplug looks like. Foam, silicone, custom, Hi-fi, wax, vented, non-vented are all types of earplugs available today. The kind of earplug you use depends in large part on where or how you will be using it. If you are a worker and have daily exposure to loud sounds, you probably want to invest in custom earplugs. Not only can you be better assured of the noise protection rating, but custom earplugs fit better, are more comfortable, and less likely to cause irritation that can lead to infections. If you are using earplugs for swimming or surfing make sure that they are waterproof--either silicone or wax. Hi-fi earplugs are made for musicians, allowing them to hear the sounds they need to hear while protecting the ear hair cells from other sounds. Vented vs non-vented depends on the kind of pressure the ears will be under when earplugs are used. Typically vented is used for water sports. A decibel is a way to determine the loudness of a sound. The higher the number, the higher the sound. A normal conversation level would clock in around 50 decibels, a hairdryer around 85, and a jet engine 120. Over 120 decibels can cause instant damage to your hearing. Noise reduction rating (NRR) is a measurement of how well earplugs block the level of decibels. The highest NRR is 33. So you would assume that a decibel of 85 would be lessened to 52. You'd be wrong. Sorry. This is the confusing part. The rating on the earplug package isn't as straight forward as it seems. The CDC states, "NIOSH recommends derating the NRR by a multiplicative factor of 75% for earmuffs, 50% for slow-recovery foam earplugs and custom earplugs, and 30% for all other earplugs." So you need to cut the Noise reduction rating by 50% for earplugs. If the package says 33, you can expect protection more along the lines of 16 decibels. This is typically why someone who is exposed to really loud noises every day will wear a custom earplug or wear earplugs underneath headphones or simply invest in noise canceling headphones. According to the CDC, "Combinations of earmuff and earplug have yielded impulse peak reductions of more than 50 dB." The use of earplugs often makes people feel invincible when it comes to hearing or that they are doing all they need to for their hearing. Not true. Your ears need to be properly cared for annually. And above all don't ignore a stuffed up feeling in your ears. There might be no pain involved with a stuffed up feeling in your ears, but doesn't mean that it should be ignored. Hearing loss is typically painless. If you have that stuffed up feeling, be sure to see a hearing health professional and have your hearing tested. Even if it is earwax that's causing a temporary hearing loss, doesn't mean the effects aren't the same on your brain as someone who has permanent NIHL. Hearing loss has been shown to have a number of physical as well as emotional repercussions. It increases the likelihood of Alzheimer's and dementia. So make an appointment today to visit your hearing health professional! Don't have a hearing health specialist? Click HERE to be connected with the largest network of trusted hearing health professionals in the nation! If you find traditional earplugs do not work for you or your child--either not fitting properly, causing irritation, or falling out--consider having them custom made. An audiologist or hearing health specialist can make custom earplugs to fit securely within the ear canal. In addition to taking the time to have custom earplugs made, don't forget to get your ears checked while you're there!